Event Description : MUSIC : Susmit Sen Trio Live! 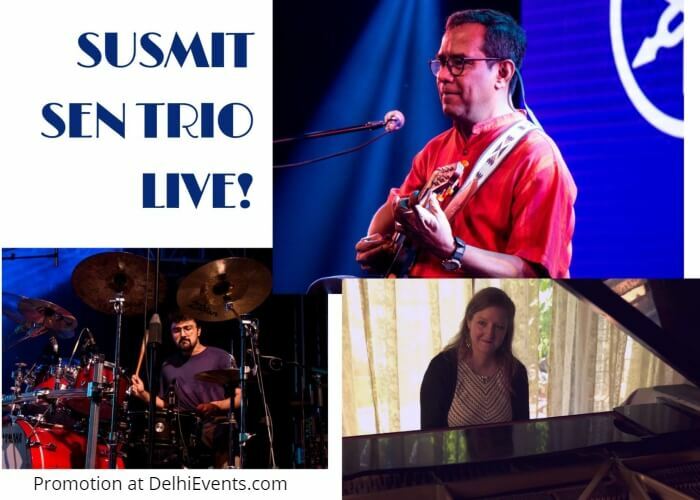 Renowned Indian guitarist Susmit Sen, American pianist Melanie Hardage, and Indian drummer and percussionist Nandit Desai began a unique collaboration in 2017 to form the Susmit Sen Trio. With Susmit’s self-taught and distinctly Indian guitar sound, Melanie’s Western classical influence, and Nandit’s Indo-Western rhythmic style, the result is experimental music with elements of jazz, Western classical and folk fused together with Indian beat patterns and scale. The Susmit Sen Trio is a series of dynamic musical conversions which takes the listener on a journey that has been described as magical.